Beer #352 is Oktoberfest by Climax Brewing Company. 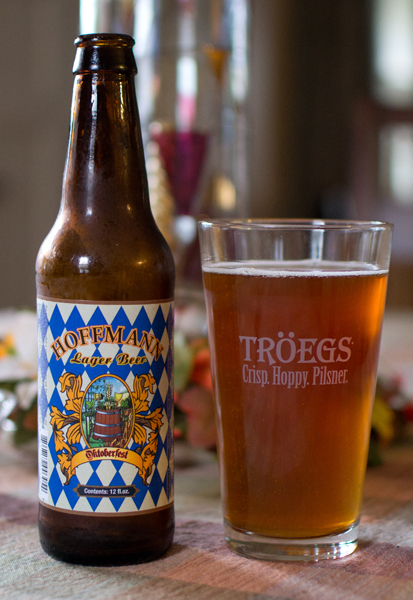 This Oktoberfest/Marzen is brewed right here in New Jersey and has an ABV of 6.2%. Appearance – Amber color with quite a bit of an orange glow. The head was just a sliver of white. Nose – Hmm…it had a sour funky smell to it and a smell very much like baked apples. My grandmother used to bake apples as a treat and this is what it reminded me of. Taste – A sour taste hit me first followed with a heavy dose of bread. There was a perfume like thing towards the back end of this also…all in all…a very odd tasting beer. I started to think that maybe this was actually spoiled in some way. Mouthfeel – It had a body just south of medium and some really low amounts of carbonation. Did you get it? Well if you didn’t…you better. Steel Panther just released their 2nd CD/MP3 album today, Balls Out. Absolutely brilliant…this is what heavy guitar rock or metal is all about. And talk about the lyrical themes here…mind blowing. I raise a toast to Michael Starr, Satchel, Lexxi Foxxx, and Stix Zadinia…this beer is for you!!! Panther rocks!!! 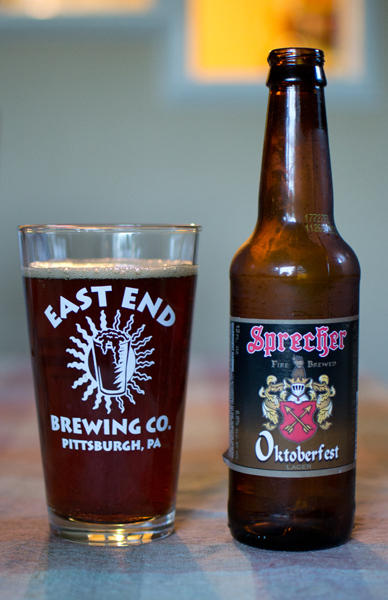 Beer #338 is Oktoberfest by Sprecher Brewing Company from Glendale, Wisconsin. This is the last of my Beer Of The Month selections…at least for this month. This is a Marzen or an Oktoberfest with an ABV of 6%. It poured the color of amber with a minimal off-white head. The nose was really light. It consisted mainly of caramel and bread. The taste followed suit with it being quite malty with a slightly sweet caramel flavor and a nice crust from the bread kind of taste. There was a bit of a nutty, earthy thing going here also. It had a mdeium body, was light on the carbonation and was quite smooth. It would be quite easy to drink quite a few of these. This was a pretty solid brew for its style…definitely above average. I was never a big fan of this style, Marzen/Oktoberfests, but I think it they have really grown on me. Nice tasting, light in alcohol content, very drinkable…what is there not to like? 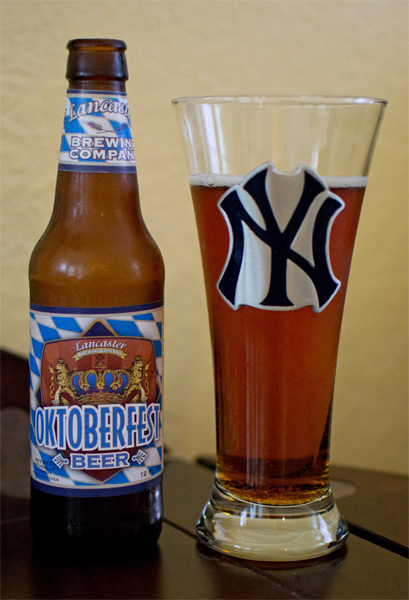 My last beer in my Oktoberfest fest…will this top the Brooklyn Oktoberfest? Lets open it, pour it, and taste it…shall we? 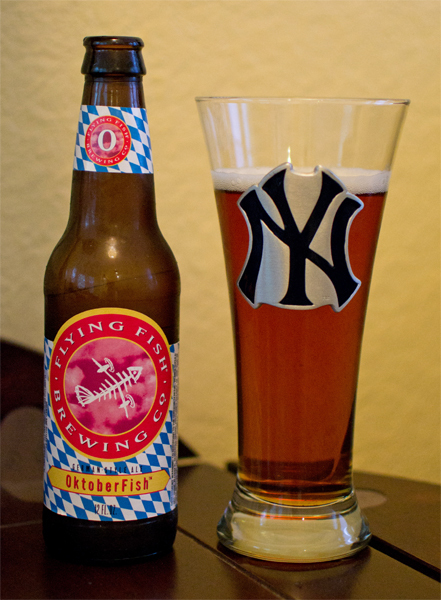 Beer #308 is Oktoberfish by Flying Fish Brewing Company. 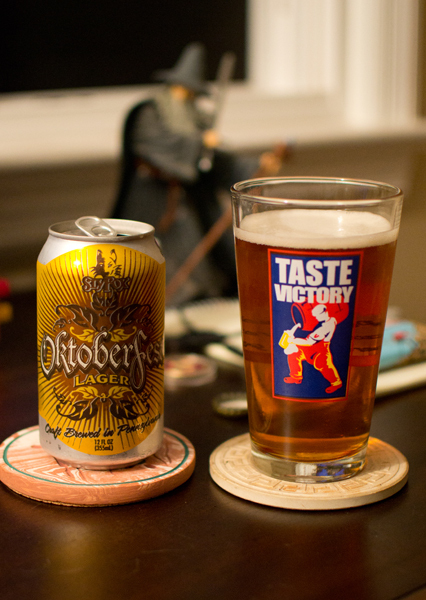 Brewed in Cherry Hill, New Jersey this Marzen/Oktoberfest has an ABV of 5.5%. Was I surprised when it poured an amber color with a white head? No. Was I surprised this had a light nose with aromas of caramel and toast? Nope. I wasn’t shocked by the taste either…slightly caramel malts with a toasted bread like flavor. It had a bit of a nuttiness near the end also. One thing that set this apart from the other Oktoberfests I have had was that the carbonation was heavier in this medium bodied brew. This wasn’t bad but didn’t set itself apart in any way and I wasn’t a big fan of the heavier carbonation here. My Oktoberfest fest is now officially done and Brooklyn Oktoberfest was my favorite. I think during the month of September and now the start of October, NJ somehow moved to Seattle. It seems like everyday we have had rain…very annoying. I don’t mind the rain but man…enough is enough. Beer #307 is Oktoberfest Beer by Lancaster Brewing Company. This is another in my Oktoberfest fest from the home of the Amish…Lancaster, Pennsylvania. Their version of an Oktoberfest or Marzen has an ABV of 6.5%. Into my Yankee (go Yanks!) glass this went with a nice amber color with no head. There was quite a lot of tiny little bubbles rising to the top. The nose was light again with caramel and bread but no grassy hop like aroma from the previous Oktoberfests I have had. The taste was mostly sweet (slightly) caramel with some bread. There was a bit of wheat and grains here also. It had a nice crisp finish to it, moderate carbonation, and medium body. This was another Oktoberfest that was quite drinkable. I guess that is the point since anytime I have seen photos of people with a beer in hand at an Oktoberfet in Germany, the glasses are huge. They are 1 liter or 2.11 pints of beer…yum!!! This was a decent version of a Marzen. The version from Brooklyn was better though. Prost! Yeah baby!!! Playoff baseball tonight with my Yankees going up against the best pitcher in the MLB, Jutin Verlander of the Detroit Tigers. I have been lucky to be able to get to see the Yankees in so many playoff series since 1996 and I have enjoyed everyone one of them…win or lose. It is a bit sad though to know that this is probably the last time I will get a chance to see Jorge Posada suit up as a Yankee. I’m glad Posada will be getting some playing time this series with all the righties Detroit will be throwing against the Yanks. Go get ’em Jorge!!! Time to drink some beer! 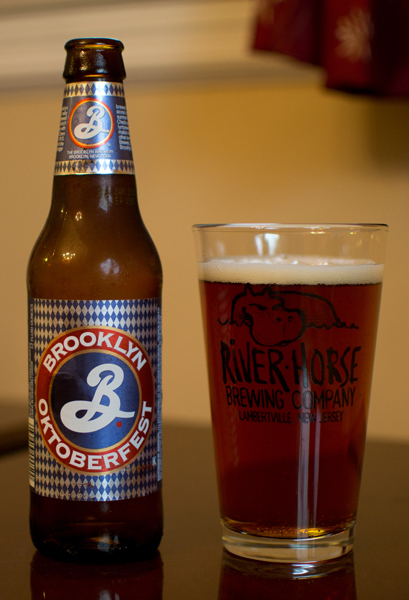 Beer #305, another in my Oktoberfest fest, is Brooklyn Oktoberfest by Brooklyn Brewery. 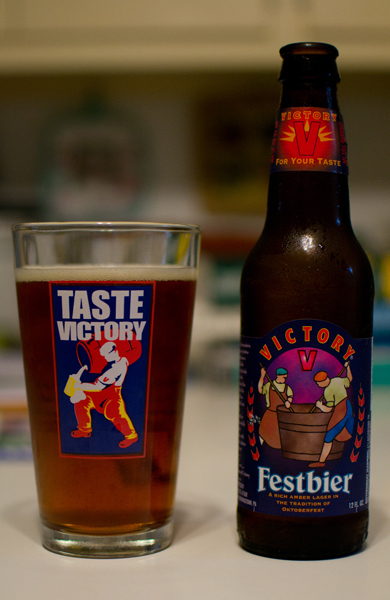 Brewed in Utica, New York, this Marzen or Oktoberfest had an ABV of 5.5%. I poured this in my River Horse glass and than I slapped myself, I have some nice Yankee glasses given to be by a friend a few years ago. The color of this brew was a nice clear amber. The head was off-white and small. The nose was light, I’m getting the impression that an Oktoberfest or Marzen has that characteristic. It was slightly stronger in the smell than yesterdays beer with the same caramel malts, toasted bread, and grass. It had a similar taste profile also with a slightly sweet caramel flavor and toasted bread but where this was different was the the grassy flavor from the hops was more prominent. It had a honey nutty like taste (the best way I could describe it) near the end that lasted into the aftertaste. The body was medium and the carbonation was on the moderate side with just a slight stinging quality. This was quite drinkable…I finished it a bit too fast. I enjoyed this Oktoberfest much more than Sly Fox’s version. I’m not quite sure I dig the style…I may have to have a few more to make that determination. Ah well…time to get ready for some baseball…lets go Yanks!!!! I stopped by the beer store for a fill up and saw a bunch of Oktoberfest/Marzen beers…so I picked a few up. Looks like for I will be heavy into that style for the next bunch of days. First up is beer #305, Oktoberfest Lager by Sly Fox Brewing Company. Brewed in Royersford, Pennsylvania this Oktoberfest has an ABV of 5.8%. It is also canned…cool! Into another Pennsylvania brewers glass, Victory, this went with a nice clear amber color. The head was small and off-white. The nose was light with caramel malts and and toast. I picked up a bit of grass in the smell. This was a tad bit sweet and had the same flavors as I picked up on in the nose…toasted bread, caramel and even a a slight grain flavor…kind of like Cheerios. It left an odd aftertaste I couldn’t identify…maybe a result of the can? Although it didn’t taste metallic to me. It was pretty light in the body and had a lower amounts of carbonation. It was very easy to drink.